We hope that it’s been a great start to your school year. Grade Level Reading is gearing up for a busy Fall. First, we are thrilled to share that Angelique gave birth to her daughter Hazel Anna-Julia Jessup on Tuesday, October 23rd. Both Hazel and Angelique are doing well and will be spending the next few months together. Angelique plans to return to the office shortly after the new year. Until then, please forward any questions to me (ruthf@ffee.org). Our next coalition meeting will be taking place on Friday, November 16th from 8:30-10:30am at the Family League. We look forward to sharing Grade Level Reading’s work and seeing you all there. We are excited to announce that we will be working closely with Danielle Torain while Angelique is on Maternity Leave. As many of you know, Danielle has been a leader in and around Baltimore for many years. Most recently, she has served as the lead on launching the Children and Youth Fund. Danielle will be working with us to ensure key projects and initiatives of the Grade Level Reading continue to move forward during Angelique’s leave. Specifically, she will oversee the advancement of our first grade work, our partnership with the Enoch Pratt Library and our Project Management Team. We are very happy to have her on board and look forward to working closely with her. Welcome to a new feature of Newsletter: Community Spotlight! We will be highlighting one person a month to showcase the efforts of our wonderful partners. This month we are highlighting one of Grade Level Reading’s community members, Anthony Wheatley, who has supported literacy within the Govan’s community. He was the recipient of a Little Free Library, which sits right outside of his barbershop. Thank you Anthony for sharing your insights and story with Grade Level Reading. We are glad to have you in our community and so proud to have you as one of our partners. Connection to Enoch Pratt. We will be coordinating two-three visits from Enoch Pratt librarians to 1st grade classrooms in our focus schools, plus at least one field trip for each school to the Pratt Library. Literacy Milestones Materials. Grade Level Reading is using the information we gained from last year’s focus groups to develop digital materials and videos for families with information about their children’s literacy development and how they can best support that growth outside of the classroom. We are excited to be partnering with Wide Angle Youth Media to produce the materials. 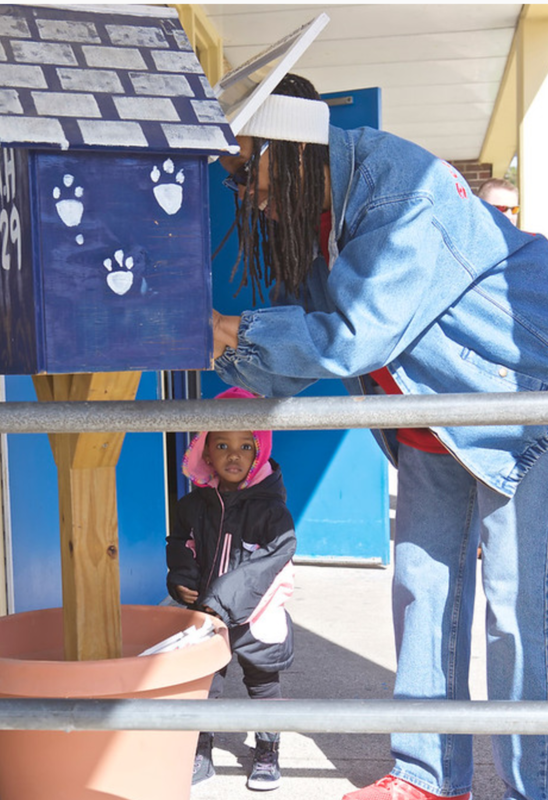 Since the beginning of the school year, Grade Level Reading has on-boarded 6 new Little Free Library volunteers to restock books. We are still looking for more volunteers, please e-mail Ruth Farfel if you are interested. Charm City Connection at UMBC is hosting a book drive for the Little Free Library at Pop!Farm in Southwest Baltimore. Here is the link to the GoFundMe page. The Greater Mondawmin Coordinator Council is hosting a book drive to provide culturally relevant books for the Little Free Libraries at Druid Hill Park, Center for Urban Families, and Garwyn Medical Center. Contact the Greater Mondawmin Coordinating Council at 410-523-4500 if you would like to donate. The raffle will be drawn on Nov. 19th and books will be distributed in November. Baltimore City Schools CEO Sonja Santelises will be visiting Enoch Pratt Free Library branches to talk with students and families about reading, writing, speaking, and listening–and learning of all kinds for all ages. You can find the details here. The Fund is offering school choice workshops to City Schools parents. Facilitators are needed to deliver these workshops, specifically people who are other parents who have engaged with the school choice process with their own children. Training will be provided and each facilitator is paid $100 per workshop. Please e-mail Corrie Shoenber, corries@ffee.org, if you are interested.